Crush your graham crackers into small pieces, using a food processor, blender, rolling pin--whatever you've got! Stir in melted butter to combine. Combine pudding mix and milk, whisking together until smooth. Add a small layer (a spoonful or so) of pudding mix to the bottom of your cups. Next, add a layer of your graham cracker "crust" (again, about a spoonful). On top of your graham cracker crumbs, layer in a few sliced berries. Fill cups up the rest of the way with the remaining pudding mix. 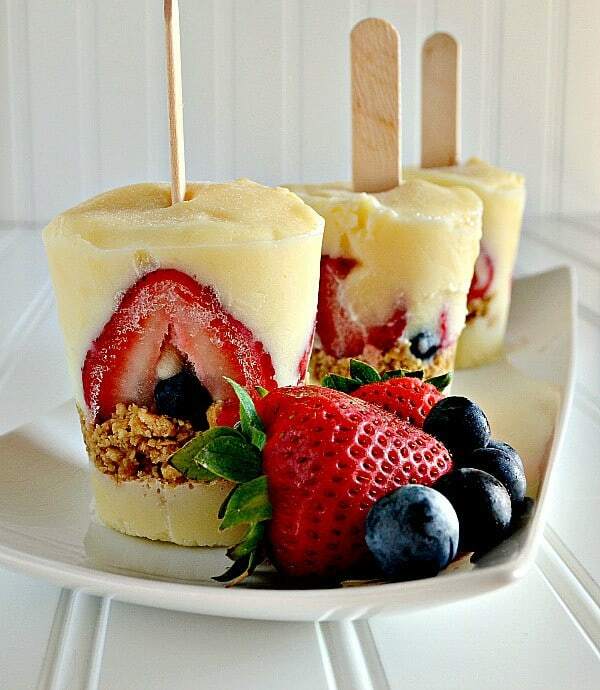 Insert popsicle sticks and freeze until set.